We just wanted to say again what a wonderful job you did with the Memorial Service. Thank you for making it so heartfelt, genuine, and appropriately spiritual! We took Sam out for dinner afterward, and he said again how pleased he was with the service. If you were sitting at that service, you would probably have seen a minister looking and sounding competent, and leading a sensitive and compassionate service. It would probably not have occurred to you to think about me being an Aspie. That would be because you hadn’t heard the back-story. I had absolutely no sense of how others perceived my presence or comments. I was thinking it was like looking in a mirror, and seeing no image. Suppose that no matter how often you look in a mirror, you couldn’t see your image. And there were no photos or videos. You only know what your face was like by what others told you; how they described your expressions and your facial features. That, to me, is what it’s like to have autism. I can’t tell what expressions are on my face or how my eyes look to others. I live with constant anxiety because of that. During this past week, I’ve been feeling increasingly stressed by having agreed to do a Memorial Service on Saturday. What was I thinking? Did I have the time? Once I agree to do something like this, it’s important to me to do it well, no matter how much time it takes. Sam had set things up with the funeral home, so I didn’t need to do that. It didn’t look like it would be a whole lot of time, really. Mostly taking up Saturday, when I had hoped to do some writing and catch up on my on-line hours. I talked with Sam on the phone. He wanted something with a Christian flavor but with openness to other traditions. He was fine doing the eulogy and I’d do a brief talk on the hopefulness of life after death from various traditions. I don’t do a lot of memorial services; esp. now that I’m not in parish ministry. I don’t keep a file of materials, so did some web searches for a range of poems, readings, and prayers for memorial services. I put together a selection I thought he might like. I put together a sample order of service. Then I emailed it to him, along with a separate email on a “to do” list for him – check on if the funeral home allowed refreshments, and could play music. Find friends to do readings, and pick a couple that he liked. I said once we settled on the format, I’d print up a little program for the service. People usually like those, both to follow the service and also to have something to take home as a memento. By Thursday I wanted to finalize things so I could print it up. Then I realized, with alarm that my printer had just run out of black ink. I’d have to order some fast. I always ordered directly through the mail, and got free shipping. But I needed the ink by Friday to do a bulletin. Could I have it by the next day? I went on-line, and saw that I could get it sent by Fed-Ex overnight for around $20. I hesitated. I really hated to spend that much money just for shipping. But if I was going to do a program for Saturday, I had to get black ink. I sighed and clicked for the order. On Friday, I kept checking by the door to see if it had arrived. It was getting dark, and still no delivery. I went on-line to see if there was any tracking number. No number. Actually I couldn’t find any confirmation that the order had actually been sent. Oops. I did it again. I made some assumptions, took some things for granted, and didn’t read the fine print. I just assumed that if I ordered a product with Fed Ex overnight delivery, which PROBABLY means that ONCE IT SHIPS it will come overnight. I read through the web site carefully. They don’t ship on weekends or on days off. And the delivery is based on when it is shipped. <Sigh>. Once again, I didn’t take the time to be sure I understood all particulars. I had ordered on Thursday when they happened to be closed that Friday. So they shipped it Monday, and I got it Tuesday; three days after the service. When I got diagnosed, it took me awhile to figure out just how I had trouble with communication. I’ve had books published; I write and deliver sermons for a living. But, as I closely watch how I interact with the world, I see how many ways I don’t understand someone else, and how often others don’t understand me. I have to slow down and go over everything to make sure I’m communicating. That’s one thing I like about on-line ministry; with most things in writing I can check and re-check every word. But, I ordered ink without reading all the fine print and thinking it through. An NT might automatically realize that the delivery date is dependent on the shipping date. I was ordering Thursday afternoon, so was sure I’d have it Friday. Uh, that is actually what I thought? Really? Yeah; I’ve got autism. By Friday evening I was approaching meltdown. I hadn’t heard from Sam about which names to put on the program. I couldn’t print the program, anyway, unless I maybe used colored ink instead of black. Was that appropriate? It didn’t feel right. I was approaching meltdown – when I just can’t function; can’t get anything done. I can be shaking with anxiety, or have overwhelming agoraphobia, or find my mind just blank and unable to function. I was thinking I couldn’t do one more thing to try and get these programs together. It was beyond my pay grade. Was I even getting paid? I didn’t know. They hadn’t asked and I hadn’t said anything. Most ministers have a set amount they charge for funerals and weddings; even for their own parishioners. I didn’t do that when I was in the parish. I asked my parishioners to donate something to the church. Actually, that’s also what I did for people outside the parish. But I was pretty sure most ministers do charge for these services, and my denomination probably had a recommended scale. I just wasn’t sure I was really comfortable charging for something that seemed like a sacred function. I don’t charge for spiritual direction, either. He got the service draft, but the “to-do” hadn’t come through. I called Sam. He was surprised that I asked about who he had picked for readers. It was then that it hit me. Ooh-oh. That request was in the document he hadn’t received. But he said we could just get people there. I made some suggestions and we came up with a plan. I was giving up on getting any ink for my printer and told Sam I didn’t think I’d be able to get programs printed. He was silent. I could tell he was disappointed. I said I could probably do them if he was OK with blue ink. He said that would be fine. But I didn’t feel good about it. Wait! I always ordered my printer ink online. But was I absolutely certain I couldn’t buy it in a store? That printer had come from Wal-Mart. Might they not have the ink? I went on-line to find out. But I couldn’t get the Wal-Mart site to work. Oh, heck. I’d just get in the car and drive the 15 minutes there. It was already 10 PM, but they were open late. I went over and YES – they had the black ink I needed! I started to relax. I realized I didn’t have to go to the play I was planning on for Sunday. I had cleared the day for the play, but I could just stay home and write instead. That felt so much better! As I made my late-night run to Wal-Mart, I couldn’t help but wonder: am I crazy? Do other minister run out of black ink the night before a memorial service? Do other ministers even do a program for the event? Probably not on both accounts. But I don’t know what normal is, and I like being able to provide a program for the family of the deceased and those attending. Now to do the program back at home. I was up till 2 AM. Getting it together. Then I had to figure out what to wear. I usually wear slacks, but it seemed that this should be a skirt. I had an old skirt that was black with a design and a little jacket with it. I saw that my clergy shirt would just fit under the jacket. It was a long skirt and I wasn’t sure if that length was still in style. I could only tell what was in style by shopping for clothes and seeing what was on the rack. This past summer I got one long skirt for my nephew’s graduation and one short one for the church convention. I put on my skirt, clergy blouse, clergy collar, and little jacket that matched the skirt. Oops! The bottom button was missing. Oh, dear. Well, probably no one would notice. Or would they? It didn’t look right if I wore it open. If I buttoned it, that bottom-missing button might be noticed. I didn’t have time to try to find and sew on a new one. I needed a pin! It took a bit of looking around, and I couldn’t find a safety pin. A straight one would have to do. I fiddled, and finally was satisfied that no one would notice that the bottom was fastened with a pin instead of a button. Oh-oh. The sleeves of my white blouse were sticking out of the short sleeves on the jacket. I’d better fold them up carefully so they wouldn’t fall out during the service. I worried about getting lost, which happens a lot to me. So I left in plenty of time, and got there an hour early. I introduced myself to the man who seemed to be charge of the home. I set my things up on the podium and played with the mike. I have such a hard time knowing just how close I should be to a mike. The man came around and showed me how to turn it on and off. I had to practice. I wasn’t holding the button down long enough, and he demonstrated. I have a very hard time turning things on, and hate to fiddle at a podium while I’m speaking! I had to go to the bathroom, and rechecked the pin and the sleeves. They needed some adjusting, and then looked fine. Ah, people were arriving. I wasn’t quite sure what to do. Sit quietly in my chair up front by the podium? Walk around and introduce myself? I did some of both. It was an awkward time. I’m much better at officiating behind the podium than I am at meeting people and trying to find something to say. Fortunately there were displays of photos, and I could stand by people as they looked at them. We had some light music playing at the beginning. It was quite soft. I figured I’d better check on volume level with the guy. I walked into the hall, and was baffled as to which one he was. There were several men in suits walking around. Which were the funeral men and which were guests? I have face blindness, and can’t remember the face of someone I’ve just met. I have trouble recognizing even old friends if I run into them outside of the usual context. I’ve learned not to use names, but to just say “hi!” until I’m sure I’m properly placing the person. I wasn’t sure about the man standing just outside the door. Was he a guest? The two men standing by the front door seemed most likely to be from the home. I went over to them, and they engaged with me in a discussion on music volume. We planned that I would start as soon as the music stopped. It seemed to stop, and I tried to make eye contact with Sam. But he was engrossed in conversation with the person next to him. I figured we’d better get started, as it was already 15 minutes after the hour. So I began. Just as I started speaking I thought I heard some faint music. Oh, dear – was the music still playing? Did I start too early? Could people hear me OK? I asked if people in the back could hear, and I think I saw nods. I just had to hope for the best. I gave my introduction and my brief talk on life after death. I couldn’t tell how people were reacting. Were they bored? Insulted? Thinking it was totally inappropriate? Thinking it was just perfect? Were they hearing me at all? I just didn’t know. But at least I had a defined role for the next half-hour and was able to walk through it. It was after the service that my anxieties got triggered again. Now, it was social time. I couldn’t just walk out, of course. People stayed for refreshments. It was easy at first to chat a bit about the service and the life of the deceased. But the room had an awkward chair arrangement for chatting. It was a small room with coffee maker and a table of refreshments, with straight back chairs lined along the walls. A strange way to have conversations! Either you stood up in the center of the room to chat, or you sat in a chair with someone on either side of you, but not across from you as in a normal conversational setting. There weren’t any chairs open, so I stood to chat. Then a male friend gave me his chair, next to his wife – a friend of mine. We chatted a bit. Then I found myself in a conversation with the man on the other side of me. We talked about his friendship with the deceased, his travels around the world, and his thoughts on various political issues. It was fascinating talking with him, then after awhile, I began to wonder if it was inappropriate to spend too much time talking with one person? Always an issue for me in social situations. The norm seems to be to rotate about the room and have numerous short conversations with people. But my inclination is always to go off in a corner with one interesting person and have a real conversation. But that’s not what the norm is in most social situations, and I was here in an official capacity. I figured I’d better talk to more people. I got up to get more coffee and than touched base with more who had attended. I needed to say “good-by” to the husband of the deceased who had asked me to officiate. Earlier he had said to be sure and talk to him before I left so we could settle things. What did that mean? Probably, he had a check for me. Or wanted to ask me about how much to write a check for. What to do? I didn’t know if I was charging for my services or what to charge. As usual, I didn’t feel that I had done anything to warrant a fee. And I hadn’t said anything when he engaged my services. If I had planned to charge a fee, I would have said so up front. I hadn’t. And still wasn’t sure if I was. I needed to say good-by to Sam, but didn’t know what I would say. He asked me what my fee was the service, and I told him there was no charge. I said he was a friend of a friend and I was happy to just be able to participate at this significant time of transition. I said, “Absolutely.” Although I’m never absolutely sure of much of anything! But I knew in that moment that that was how I felt; it didn’t feel right to accept a fee. As I left, I felt incredibly relieved that it was over. I had cancelled plans to attend the play, and would have two full days ahead of me to just stay home and write. A rare opportunity. Most days I had least one or two clients coming to my house, or clients I needed to visit in their homes. And I had a client just admitted to rehab center who I wanted to visit. But I had cleared two days, and I wanted to use them. This was one of the few clergy events I had officiated at since my diagnosis. I’m now in a process of actually noticing how much Asperger’s impacts my work. It is amazing to notice. I see a number of areas where I need to provide some accommodations for myself in doing Memorial Services. I need to find out if my denomination has a suggested fee structure for memorial services and weddings. I need to decide if I want to charge a fee when asked to perform such services. If so, to tell people up front. I want to think about situations where I really do want to donate my services, so that I’m clear myself that is what I’m doing. There are times – like this service – when I really did feel that I wanted to help out without a charge. I re-consider whether I can really offer to provide a printed program. When I got there, I saw that the funeral home had provided a little fold-over paper with the date and name of the deceased. And name of officiant – me. [I noticed that they hadn’t put “Rev” in front of my name. I really should make contact myself with the home prior to the service to go over details like whether they’re doing a handout themselves. I need to sort out how being an Aspie impacts how I do ministry. There have been times when I’ve questioned whether I should be a minister. Does having autism preclude one from having such a career? I think I proved to myself that I CAN be a minister. I got really good, trustworthy feedback on my service. I know now that it was a good, professional service with little extras for the family that went “above and beyond” what many others would do. If you had been sitting there, you would have seen a good, professional, and caring memorial service. The question for me is always: what is the cost to me? I know I can officiate well at a memorial service or a wedding. I can lead a good worship service with a fine sermon. But I’m certain that it takes me far longer to do these things than it does other ministers. I spent many hours figuring out the service, the printing, my clothes, the directions to the home – I always get lost. I think I need to find my own “accommodations.” For example, by making some decisions about how and when I want to do memorial services, it will be easier. I’ll keep a file of materials, have a fee structure handy [maybe with a sliding scale], and be clear about when I want to donate my services. Be careful about taking on too much in my busy life. I have to be careful to avoid “meltdowns” as I can get so inundated with sensory input and anxiety. I fall into bed and pull the covers over my head. I can’t function at all until I can pull out of it. Yes, I can be a good Aspie minister. But I need to keep remembering that there is a “back story” for me in what I need to do to perform the role well. To me, it’s worth it. That is from “Canticle of the Turning” by Rory Cooney. It is one of the pieces of music done by the choir at our annual church convention. I love the music and the words! It was inspired by an Irish melody and Mary’s Magnificat. I do feel that my world is about to turn. I am changing from being a minister who feels defective to becoming an autistic minister who feels empowered. For the first time at a church convention, I didn’t feel that I had to hide in my room, so that — what I now know to be my autistic characteristics — wouldn’t show. Instead, I let the autistic me out — to sing and dance to music and whoop and holler while playing rounds of Uno. I met privately with several other ministers, and let them know of my Asperger’s diagnosis. They were very supportive, and it was a relief to be known and accepted. I had a meeting with my peer ear minister who knows of the autism, and could process the experience of being so openly me at Convention, and coming out further. I talked more with the prospective publishers of my manuscript, and realized I was actually able to talk about it without feeling embarrassed. Usually, I leave the convention feeling exhausted. This time, I left with joy. I was tired, yes; but my heart was full. The joining together of the “minister me” and the “autistic me” is a bit like me and God working together. It felt right. The world is about to turn. Once again, there has been a horrible, violent crime committed by a person with mental illness. Once again, the media is focusing on a diagnosis of “Aspergers” or “Autism” as the reason for the crime. 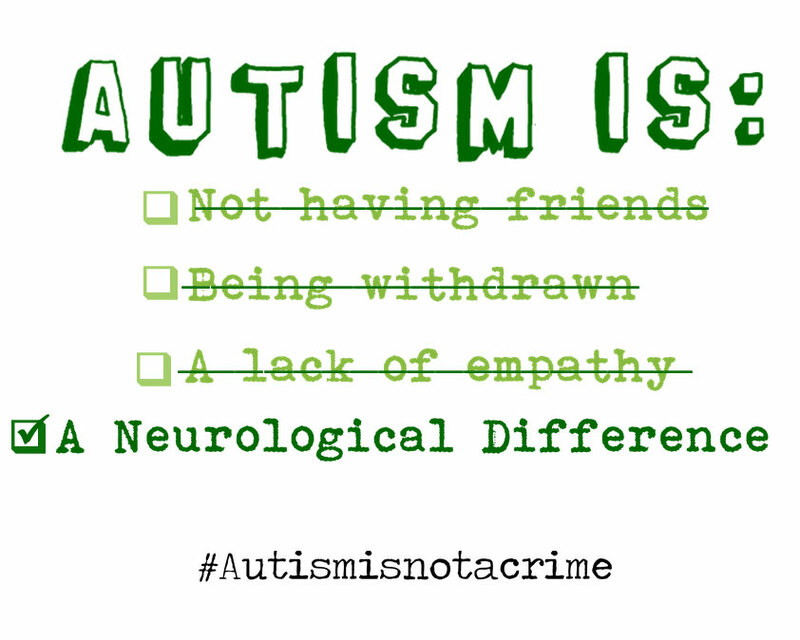 We need to put a stop to this blaming of the autistic community for violence. Or even blaming mental illness for violence. Or blaming the therapists who work with the mentally ill. It is time that we took a serious look at the relationship between violence and gun ownership in our culture. We also need to recognize the stigmatizing of mental illness. Every time “Aspergers” is blamed for violence, it makes it that much harder for people with the diagnosis to seek treatment. Think how different our society would be if people felt as comfortable going to a therapist for mental illness as they do going to a physician for a physical ailment. Our churches, too, need to become communities of welcome and support for people with mental illness; providing community of faith for those in despair. Easter makes all the difference. It’s not about the anxiety and fear I live with every day. That sentence has a focus on “I”. It’s about how much God and I can help others. That sentence has the “I” with God. There are others even lonelier than I am, living in even more fear than I have. At least I have a job — one that I love very much — as a minister. I have a voice that God can use. Guide me to where you need me, God. Let’s get to work!